I attended "Making the Transition to People Management - Situational Frontline Leadership" course in June 2017 and completed it by taking an active part in the activities and presenting the new tools/techniques learned from the course. This course focuses different development and leadership styles and specifically how each can benefit the other. 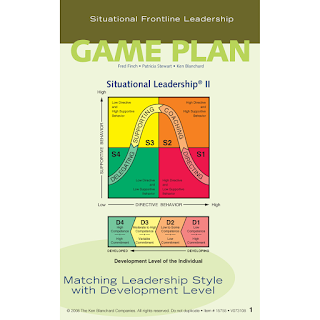 This course is based on "SITUATIONAL FRONTLINE LEADERSHIP (GSA) - Improve leadership skills required to partner for performance at each stage of development". It will give you several different tools and techniques to use while leading your team members. The following is a good summary of the game plan.